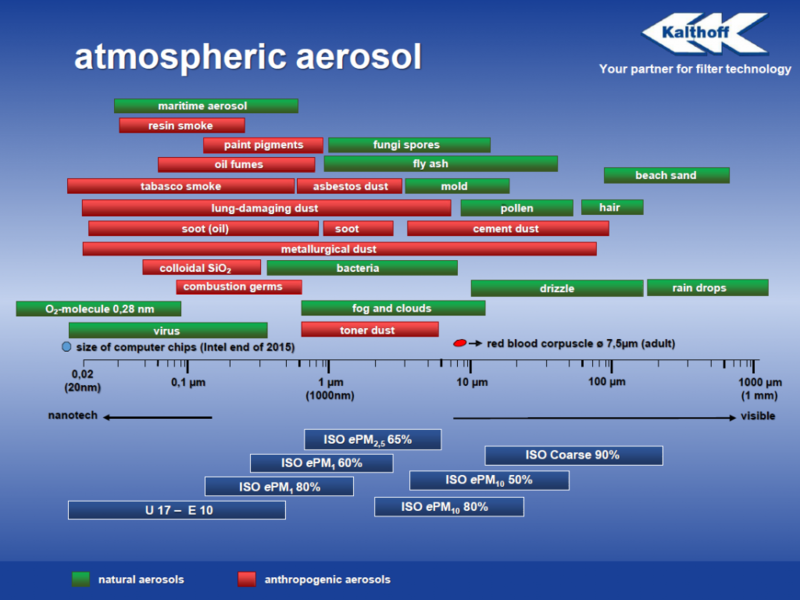 In ambient air there are solid or liquid aerosols, micro-organisms and gases present. According to size, they are called coarse-dust particles, fine-grain dust particles or suspended dust particles. All particles smaller than 0.4 µm in diameter are suspended dust particles and are summarised in the group PM1 (PM = Particulate Matter). Particles up to 10 µm are designated as fine dust (PM10). All sizes above that are coarse-particle dust. They represent more than 95% of the volume and the mass of the atmospheric aerosols and are for example hairs, rain, pollen or coastal sand. With reference to the total number of particles, however, they play a subordinate role. Fine dust and suspended dust particles occur particularly in urban population centres. They arise mostly in case of combustion processes (e.g. traffic, heating systems) and with industrial processes (e.g. production, power generation) and are not visible to the human eye. More than 98% of the particles are less than 1 µm, so that this category represents the main problem. These particles can clump to form large, jagged surfaces and as a result indicate a high adsorption potential for gases, liquids and also biogenous substances, such as micro-organisms. As a result of the adsorption processes of pollutants (e.g. heavy metals, hydrocarbons, pesticides, plasticisers, flame-retardants, however, also bacteria and viruses), the hazard potential of these fine dust and suspended dust particles, which are already toxic anyhow, is increased by a multiple. Unlike the coarse-particle dusts, the human defence system is frequently powerless against these toxic fine dusts, so that they can penetrate into the organism almost without obstruction. With bad results. In the respiratory organs, fine dusts can lead to illnesses, such as bronchitis, asthma or even carcinomas. Also the aggravation of allergy symptoms is possible. Particles less than 0.1 µm can advance far more deeply into the human organism and even pass alveoli and cellular membranes. In this way, they reach the blood circulation directly, where they are frequently triggering cardiovascular illnesses. According to WHO, as a result of the entire fine dust pollution, the population of the EC has on average a lifetime expectancy which is reduced by one year. At the present time, environmental awareness is one of the central topics concerning persons, companies and government authorities. This is because the increasing level of air contamination is becoming an ever greater problem which does not recognise national borders. In order to minimise dangers to health, limit values on air pollution in the outdoor air have been defined on a European level with the Directive 2008/50/EG. Typical dust concentration values can be taken from VDI 3677. In case of indoor air pollution, a value increased by 2x to 5x occurs in comparison with outdoor air. The cause is in the increased air-change rates of inadequately-filtered outdoor air through air-conditioning systems, and the outgassing of substances in the rooms. Included here (among other things) are printers, different types of textiles and clothing, as well as persons themselves. Therefore filtration is especially important in buildings.